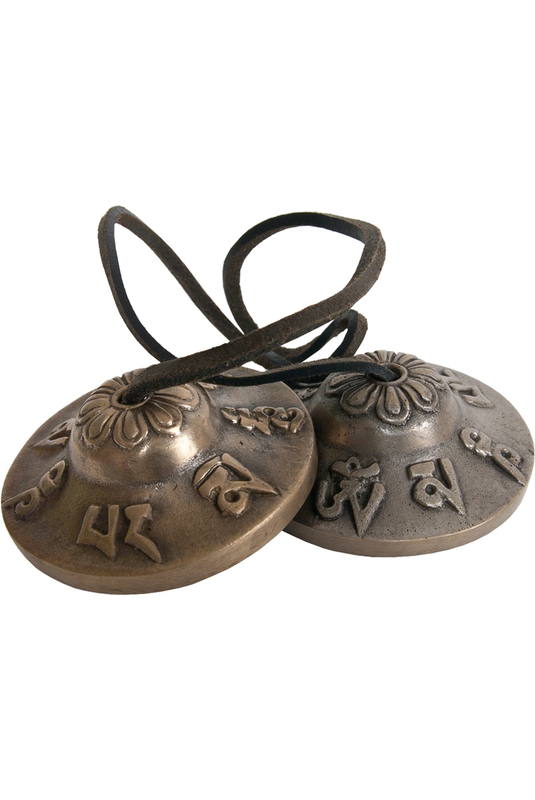 DOBANI 2.50 Inch Timsha Bell Embossed Brass Mantra TSB250 C. These timshas are embossed with the mantra Om Mani Padme Hum in Tibetan. This is the mantra of the deity of compassion, Avalokitesvara, and loosely translates "Hail to the Jewel in the Lotus Blossom." The timsha Bells are a ritual artifact by Buddhist Monks, as well as in the Shamanist traditions. The Timsha's are made of a complex alloy of bronze copper and tin and also iron and zinc. Measures 2.50" in diameter. When these unique hand cymbals strike each other they produce a clear, pure, cleansing sound which can be used to focus the mind before and after meditation. When played as an instrument they can be used as a chime or a bell. When playing you grasp each cymbal by the cord, at the point where it enters the timsha and hold firmly and strike the edges together at an angle. They can also be used to clear the space of any negative energies.